Lawn care and landscaping require time, money, effort, know-how, and skills. Of course, many homeowners choose to work with reputable contractors who can offer impeccable lawn maintenance and landscaping services all year long. But it seems that fertilization & weed control is a sensitive topic for many lawn care companies as people want – more and more lately – an innovative and alternative approach to the traditional use of chemicals and herbicides. Today our fertilization & weed control North Richland Hills TX experts are here to tell you a few things you need to know about their services. How Can Be Fertilization & Weed Control Treatments Deemed Innovative? We are a company with around 15 years of experience in lawn care and landscape management. We developed and fine-tuned a 7-step fertilization & weed control North Richland Hills TX program that soon became a standard of good practices. We will detail this program for you to make an informed decision next time you shop for innovative services. We first perform a soil, vegetation, and micro-ecosystem evaluation to better understand the soil’s pH, the strengths and vulnerabilities of your plants, the types of weeds more prone to invade your property depending on the soil type, weather conditions and environmental factors of your area, including the number and varieties of beneficial insects and wildlife. Our 7-step fertilization & weed control program consists of regular treatments (5-7 weeks) throughout the year; this means that our lawn program consists of seven treatments per year, including pre-emergent weed prevention, fertilization & weed control. Our innovative program is also based on integrated and complementary lawn care tasks; we offer full fertilization programs, disease and fungus control, insect and grub control, core aeration and the use high-quality bio-based weed control products. One of our trademarks is represented by our tailored, customized bio-based products; our organic and semi-organic fertilizers o much more than just keep your lawn green, they serve to rejuvenate the soil and strengthen your lawn’s root system. 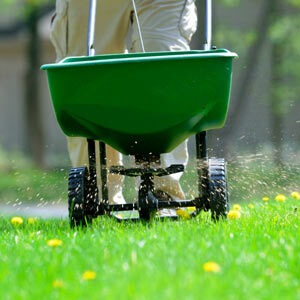 We won’t just spray your lawn, but also make sure everything goes on as planned; there is no treatment without follow-up and control, and this is exactly what we offer; our fertilization & weed control North Richland Hills TX will analyze your lawn each visit, treating it for any insects or diseases and leaving recommendations for watering and maintaining the health of your lawn. In case you need advanced and healthy fertilization & weed control North Richland Hills TX services, gives us a free call and ask for an estimate! As a bonus, we don’t charge extra for grassy weed control like other companies!